Milk and chocolate, what a combo! Who doesn’t love chocolate milk? Problem is not all chocolate milk is created equally. Some chocolate milk is full of high fructose corn syrup. Some chocolate milk is 1% or lowfat. Some chocolate milk lacks a strong chocolate flavor and leaves you thinking you would be better off mixing regular milk with chocolate syrup. 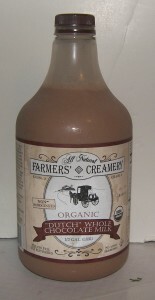 But then there is Farmers’ Creamery Dutch Whole Chocolate Milk. It is not equal to other chocolate milk, it is beyond any other chocolate milk. Why makes it so great? For starters – fat. This is whole milk, not no skim or low fat milk. When it comes to chocolate milk it not about drinking what’s healthy. The milk used to make this chocolate treat is different from most milk you buy in the stores for 3 reasons. 1. Grass fed cows – The cows that the milk is from, eat grass. This is what cows naturally eat. Sadly farms today force cows into eating grains and this is not good for the milk or meat of the cow. If you don’t believe me try some grass fed beef (or better yet find this milk and try it). You will taste the difference. 2. Low-temperature pasteurization – All milk that is sold commercially must be pasteurized. The milk is heated to the point in which there will be no chance for any nasty bacteria or pathogens. Most companies heat the milk to a high temperature for a brief period, because it saves time (and “time is money”). But by using a high temperature you kill a lot of the flavor along with any bad stuff. Farmers’ Creamery uses a low-temperature pasteurization that takes longer however it preserves more of the milk’s flavor. 3. Non-homogenized – Homogenization is the process of breaking down the milk molecules so that they stay mixed together. Non-homogenization milk has what is called a cream top. In a way milk is less salad dressing, in that it can separate and needs to be shaken. The homogenization process makes it so that you don’t have to do that, but I also think it tastes away from the creaminess and overall mouthfeel of the milk. The ingredients in the Farmers’ Creamery chocolate milk includes: Certified organic grade A whole milk, organic sugar, organic cocoa, organic nonfat dry milk powder, and carageenan. Carageenan is a thickening agent often used as an alternative to gelatin for those on a vegan diet. Most chocolate milk use corn starch as a thickener. I have made chocolate ice cream many times, and this milk tastes like my mixture before I freeze it. In fact I think if I just poured this milk directly into my ice cream maker I could come out with a pretty good result. It’s super rich and creamery, with an amazing chocolate taste. It it more expensive than other chocolate milks, but you do get what you pay for. I found it on sale once at my local Whole Foods Market. You can also check Farmers’ Creamery website for availability in your area.